Looking at a random aerial shot of Dubai might lead you to think you're looking at a future New York. Or London. Or Hong Kong. But this place actually exists, newer than those places and more remote, too. The hyperreal city sits on the edge of the Arabian Desert, boasting skyscrapers and man-made islands unlike those found anywhere else. And, soon, if 2K Games and Yager Development get their way, it'll be the next memorable video game locale, the place where thousands of players will shoot their way through a story of what happens when society's rules crumble in a land of excess. It's more than just the sand that makes Dubai the perfect setting for 2K Games' upcoming military shooter Spec Ops: The Line. Yes, the game's signature mechanic comes in the form of mounds of shifting granules that you can dump on top of enemies. But, in Dubai, the game developers get a locale tailor-made for the kind of action and story they want to present. The principality in the United Arab Emirates holds monuments to human excess that make Las Vegas seem tame in comparison. Lead designer Cory Davis says, "Dubai is the place where the most amazing architectural projects on the planet are happening." He's not kidding. Visitors to Dubai can travel to the Palm Jumeirah, a resort built on the world's largest artificial island that's also home to Burj al-Arab, the tallest hotel in the world. 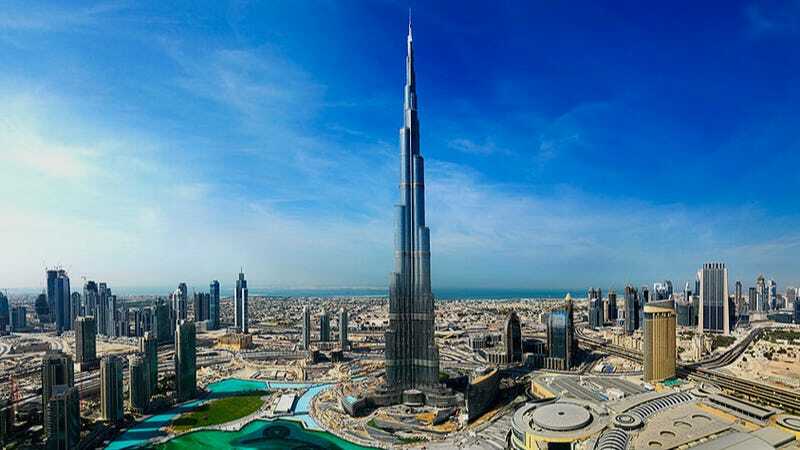 In downtown Dubai stands the Burj Khalifa, the tallest building in the world. There's money here and plenty of it. Lots of today's modern war games take place in the Middle East and focus on the more alien nature of that part of the world. You're waging war in a foreign place where the standard of living is shown to be lower and where the player can be made to feel like they're an invader. The Line's going for something different. "Because it's modern and opulent, it doesn't necessarily feel like you're walking into an extremely a third-world place," Davis offers. "At the same time, Dubai provides us also with a really good opportunity to send our squad into a location that is cutoff from the rest of civilization. We've put a twist into it with cataclysmic sandstorms that have ravaged the area and transformed it into something more exciting." It's more than just the sand that makes Dubai the perfect setting for 2K Games' upcoming military shooter Spec Ops: The Line. Players will be controlling military squad leader Captain Martin Walker as he hunts down other long-lost soldiers who lost contact with the outside world when the freak siroccos hit. The journey through a shattered Dubai provides a thematic complement to the moral chaos of the game's narrative. 2K's Walt Williams, lead writer on The Line, says, "We wanted to make it a personal story of the emotions and the troubles that people come across in just normal combat. It's not about the bigger geopolitical issues in the Middle East or what's going on over there with the various wars and combats." Most of the people you'll meet in The Line are struggling to survive, even the enemies. "We didn't have to create any newer global threat like rogue Koreans or Russians or any fake terrorist organization." 2K's not revealing much more about the plot of The Line, but the sense is that there are going to be questionable actions on the part of Col. John Konrad, the man you're sent to find, and maybe on the player's part as well. "Simply being in combat doesn't turn you in necessarily into a soldier robot," says Williams. "You have all these other emotions and personal things that you're bringing into it, that change your reactions and cause you to see things in a different way." What If a War Game Made You Question the Morality of Killing? The hope is that having The Line unfold in a place that's simultaneously a mirror and an envy of the West will energize its drama. "The survivors are making tents out of priceless wall-hangings and rugs," says Davis. "And they're drinking their boiled water out of crystal bowls. These are people that are living on the bare edge of poverty, but that bare edge of poverty is built out of items of wealth that suddenly have no value outside of simply what you can turn them into." From a gameplay perspective, Davis says that the abandoned skyscrapers and over-the-top structural design of their future Dubai creates great opportunities for vertical combat. "The way that this architecture sticks straight out of the desert causes this amazing amount of contrast and variety that's typically not seen in a military shooter," he elaborates. Video game creators love cities. The glass-and-concrete aesthetic, tight spaces and overpopulation of urban centers let designers scatter action sequences, random scares and enticing plot points all over environments that audiences know from first-hand experiences or pop culture. But at the same time, locales like Los Angeles, New York City or London have become too familiar from overuse. The Line wants to subvert any familiarity the player may feel, with a once-beautiful where horrible things are happening. Neither Davis nor Williams can talk about which real-world locations will be in the game, which is being made without the involvement of United Arab Emirates authorities. Nevertheless, if they do their job right, Dubai—the ultramodern metropolis that improbably sits in the middle of the desert—will take its place next to Rapture, Arkham City and other iconic locations in classic video games. We'll find out when Spec Ops: The Line comes out later this year.